Free sample of The Body Shop Drops of Youth™ range. 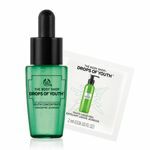 Claim a deluxe sample of the Drops of Youth™ Concentrate and a complimentary sample of the Drops of Youth™ Liquid Peel. You can also send a sample to up to three friends! There are 22,000 free samples available and you will receive a digital coupon via email that you can redeem in store. The offer runs until all 22,000 free samples are claimed or until Monday 19th June, whichever is soonest. Simply claim the sample and send the samples for free on The Body Shop Facebook page.